It’s easier than ever to keep your team on the same page. It’s a snap to create, update and close Issues in real time! You can even text new Issues to the agenda any time, from anywhere. You’ll see them on the Issues List at your next meeting. Keep your Same Page Meeting moving along on-time. 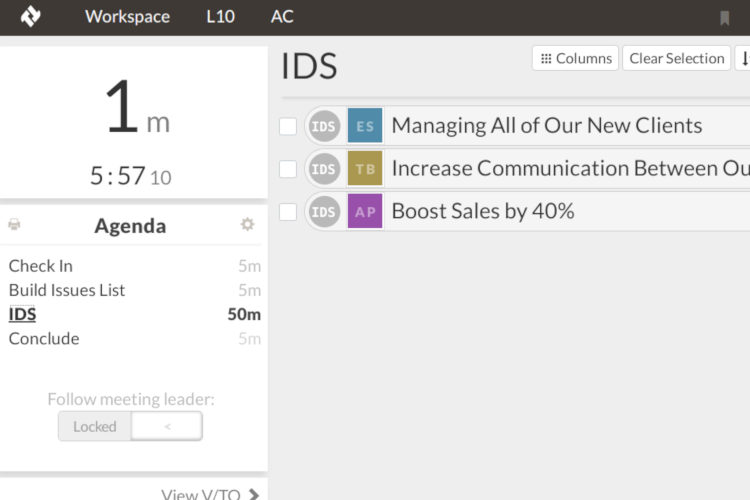 The built-in timer helps you pace your meeting for each agenda item. If you fall behind, the timer prompts you by turning red. The Same Page Meeting™ Agenda is automatically populated, so there’s no prep work! Never chase down an Issue or Scorecard numbers again. If you’re ever flying around at the last minute trying to get everything together for your weekly Same Page Meeting, you’re not alone. As the original licensed provider of EOS® software, Traction® Tools is designed to help your company run on EOS smoothly and stay on top of your Meeting Pulse. Start your 30-Day Free Trial to run the best Same Page Meetings.The software application eliminates prep work for your leadership team meetings, helps you navigate the agenda, and lets you focus on the meeting itself—rather than worrying about correctly managing the flow. Issue ranking lets you prioritize the top three Issues with a click, and get busy solving them for good. Embedded V/TO™ and Accountability Chart™ are always within reach for reference. Zoom video conferencing makes it easy to participate remotely or on-the-go. Meeting rating widget reminds you to rate the meeting. Access from anywhere so remote employees can participate. Everyone stays on the same page throughout the Same Page Meeting. Share data across meetings instead of entering it multiple times. You can share Scorecard Numbers and Rocks with other Same Page Meetings or move Issues from one meeting to another. Notes that travel with To-Dos and Issues and are never lost. In fact, nothing in the software is ever lost—anything can be pulled from the Traction Archive™. To-Do completion tracker boosts accountability by letting your team monitor your completion percentage and increase your completion rate. When your organization’s leadership team has the right tools, it’s easy to stick to your Meeting Pulse, solve Issues and get more stuff done. Traction Tools EOS software helps your company achieve the next level of success. We love that Traction Tools helps us be a lot more efficient and keep different teams/departments on the same page.